Sitting on the Legacy Park community in the sub-division of Highgate Park is this three bedroom villa perfect for your family holiday to Orlando. Situated just off the US27, means the Disney area is just a fifteen minute drive away. King-size bed, walk-in closet, patio doors to the pool deck, ceiling fan, TV. En-suite bathroom contains bath tub, shower cubicle, double sink, WC. Queen-size bed, slide closet, ceiling fan, TV. Family bathroom located between bedrooms 2 and 3 contains shower over bath, sink, WC. Situated on the US27 in Davenport, just a few miles south of the US192 is this three bedroom villa sitting on Highgate Park, a sub-division of the Legacy Park community. With a good-sized pool on an inviting pool deck, a games room and being just a short drive to Orlando attractions, shops and restaurants, there is something for everyone to enjoy during your stay at this holiday home. Living Accommodation - Immediately inside the villa entrance, to the right-hand side is the formal lounge with comfortable seating and a nearby formal dining table which seats six people. Continuing through the villa to the left-hand side is the open-plan kitchen with a breakfast bar and an additional table seating four people. At the back of the villa is the main family lounge with a sofa, loveseat and armchair, a flatscreen TV and patio doors to the pool deck. Bedrooms - The Master bedroom is to the right of the family lounge and has a King-size bed, patio doors to the pool deck and an en-suite bathroom. Bedroom 2 is to the left of the family lounge and has a Queen-size bed. Bedroom 3 is next to bedroom 2 and has twin beds. Outdoor Living - The outside deck has a good-sized pool and no directly overlooking neighbours at the rear of the property. The covered area has an outdoor table with seating and is an ideal spot for alfresco dining by the pool, out here is a great place for relaxing in the Florida sunshine. Entertainment - The games room located at the front of the villa to the left of the villa entrance is equipped with table tennis, table football, basketball and seating. Legacy Park is large community just off the US27 completed in 2007 and divided into 7 smaller subdivisions, including the gated Highgate Park. 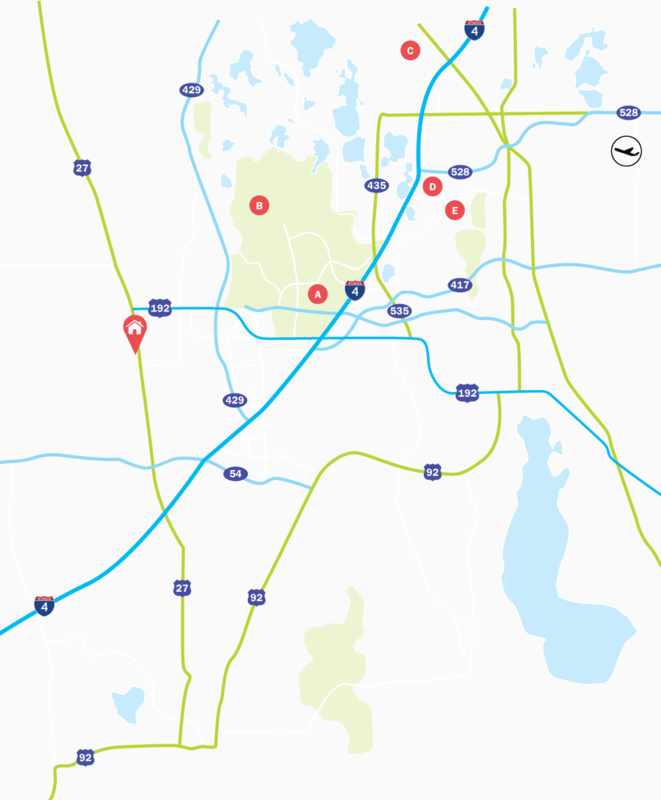 Disney theme parks are a short drive away along the US192, with Orlando’s other attractions; Universal, SeaWorld and International Drive all within a 30 minute drive.